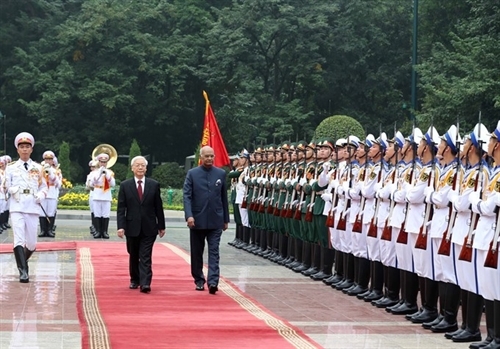 Vietnam would continue its close co-operation with India to deepen the comprehensive strategic partnership between the two nations, Party General Secretary, President Nguyen Phu Trong said on Tuesday. The Party leader was addressing members of the press in Hanoi to announce the outcome of his talks with visiting Indian President Ram Nath Kovind. Besides discussing regional and global issues of mutual interest, both leaders stressed the necessity to deepen their comprehensive strategic partnership in all sectors, and agreed to maintain co-operative mechanisms and implement agreements signed by the two sides. They described defense-security as one of the important pillars in their bilateral ties and said both sides should work on removing bottlenecks to elevate two-way trade to US$15 billion. They also agreed to step up investment promotions in the fields of India’s strengths and Vietnam’s development priorities. Both leaders welcomed the co-operation between the Vietnam Oil and Gas Group (PVN) and the Oil and Natural Gas Corporation (ONGC) of India in oil exploration and exploitation in Vietnam, saying that more effective co-operative models should be put in place. In addition, they agreed to bolster collaboration in culture, tourism, aviation, people-to-people exchange and education-training, among others. The two leaders affirmed close co-ordination and support for each other at multilateral forums, especially the United Nations and the Non-Aligned Movement. Vietnam welcomed India’s “Act East” policy, and spoke highly of India’s backing of ASEAN’s central role in the forming of the regional structure in East Asia. As a coordinator, Vietnam had made significant contributions to fostering the ASEAN-India relations, Trong said. The two leaders stressed the importance of building Indo-Asia-Pacific into a peaceful and prosperous region based on respect of sovereignty, international law and freedom of aviation and navigation. Vietnam attached importance to India’s stance on the East Sea issue, and thanked the Southern Asian country for continuing to support Vietnam’s viewpoint on this issue. President Kovind thanked Party General Secretary, President Trong for giving him and the Indian delegation a warm welcome. Vietnam was a strategic pillar of India in its “Act East” policy and an important dialogue partner in ASEAN. As comprehensive strategic partners, Vietnam and India were enjoying thriving relations based on mutual trust and understanding, and close co-operation at multilateral forums. He expressed his delight over the robust economic ties between the two nations, with two-way trade reaching $12.8 billion in 2017. He said he hoped that with concerted efforts made by the two countries, they would realize the goal of increasing trade revenue to $15 billion in 2020. The Indian President also underlined that similarities in culture have served as a catalyst to strengthening bonds between the two countries.